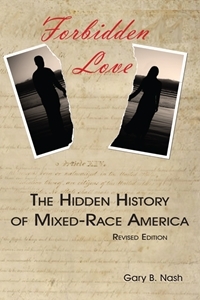 In this revised and expanded version of Forbidden Love, first published in 1989, Nash shows how Americans for two centuries tried to build social walls and legal fences to keep people of different racial ancestries from marrying each other and how these walls and fences have been dismantled in the last half-century. A number of new profiles or racial renegades, or boundary-crossers, enliven this book, which should resonate with young students who themselves are the products of mixed-race marriages or have rejected racial categorizations entirely. Chapter 9: The End of Walls? What does it mean to speak of race in America? We may think we know, but Gary Nash’s Forbidden Love: The Hidden History of Mixed-Race America suggests that the story is more complex than we might suspect. It provides a compelling account of our fraught relationship with race—of efforts, on the one hand, to construct categories that would establish barriers between people, and, on the other, of the many ways in which individuals succeeded in crossing and tearing them down. Numerous illuminating profiles intersperse this incisive exploration of a history that is both troubling and uplifting. As a mother of three mixed-race young adults whose eyes were opened by this book, I recommend Forbidden Love for its clear-eyed view into America’s evolution as a multicultural society. Forbidden Love is a heart-opening collection of stories about the interracial mixing that has been going on throughout American history. It will linger in the minds of all who read it, and it ought to reframe our understanding of what it means to be an American. Books that are both intellectually engaging and guaranteed to command student attention are few and far between. Forbidden Love is one of those books. The topic itself is compelling, especially on today’s campuses where mixed-race students and mixed-race couples are becoming commonplace. But even more important, Forbidden Love shows students that this is no new phenomenon, but has been a hidden part of American social life from the nation’s earliest days. This alone will gain student attention, but Forbidden Love does much more. By reclaiming the long history of mixed-race encounters in America, Forbidden Love reveals a distinctively English-American form of mestizaje and métissage that has long been suppressed and denied. Beautifully written and always compelling, this book is made for today’s students and will truly enliven high school, college, and university classrooms. I urge you to give it a try. Partly because West Los Angeles College is home to many minorities (student body is 50% black and 25% Latino), mixed-race issues like those presented in FL resonated with students. Many consider themselves "pure bloods" while others are undeniably "mixed bloods." Seeing the history of mixed-race America helps students to see themselves more clearly. Forbidden Love fits very well with my AP US History class both pedagogically and thematically. I was glad I used the book, and I intend to use it again next year.